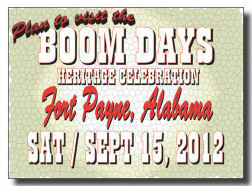 Fort Payne is the place to be this weekend for Boom Days Heritage Celebration on Saturday, September 15th. Events include a 5K Run, Pancake Breakfast, Car Show, Kiddie Train Rides, Carriage Rides and a Pet Parade! Yes, of course there will be lots of music, and no festival is complete without Barbecue! Details for all events and their location and time is on the Boom Days website.